This is my first Mercedes-1988 420SEL with over 150,000 miles. It was neglected and had many problems-transmission, suspension, rear frame, HVAC, radio, low engine power, interior worn, etc. Lots of work I put into it. Interior was palomino and worn so I replaced seats and some panels with burgundy interior. It became two tone and I really liked that combination. Then I installed Alpine radio as original radio did not work at all. Transmission was replaced with used unit but it was slipping in 3rd. I removed and rebuilt it. Engine had low power, had to tuned up and air/fuel ratio adjusted. A/C was not too cold. Had to recharge it but main issue was recycle air flap. I removed dashboard to replace all HVAC vacuum pods including recycle air flap pod. But main problem was crack in rear frame. Vehicle had been in rear end accident years ago. Whoever repaired accident damage did not do a good job and frame rusted and cracked. I did not want to replace whole rear subframe and sold the car cheap as I already bought my second Mercedes-1990 300E. 1990 300E with over 180,000 miles in non driving condition at New Jersey repair shop parking lot. Interior was very nice. Body was very good also, except for front bumper cover. Previous owner was driving the car and his air pump pulley bearing seized. Accessory belt broke damaging power coolant fan and transmission coolant pipes. I removed air pump and replaced pulley bearing. Went back to parking lot, reinstalled pump, replaced transmission coolant pipe, refilled it and drove away. 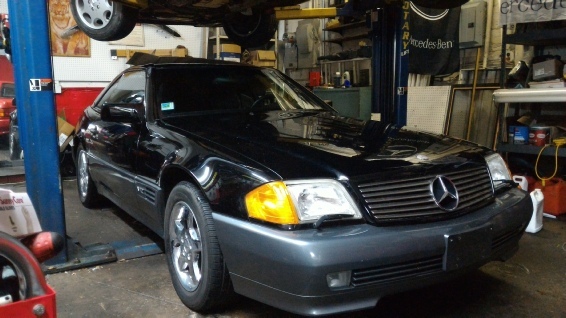 In that car I replaced engine mounts, installed Eibach lowering springs and Bilstein sport shocks, custom radio and subwoofer in rear deck, tuned engine, 17” AMG rims. Car was nice and fun to drive but I always wished it was 5-speed manual. It had M103 CIS engine and it was very happy at higher revs, automatic transmission was huge drag on performance. 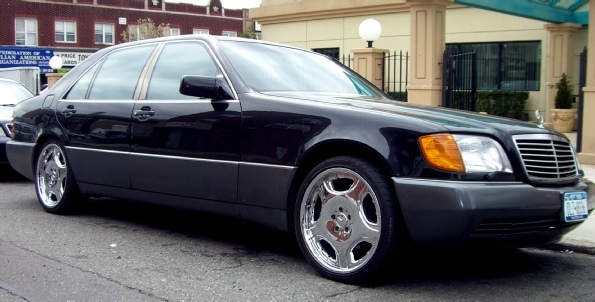 I loved this car but always wanted W140 S-class. 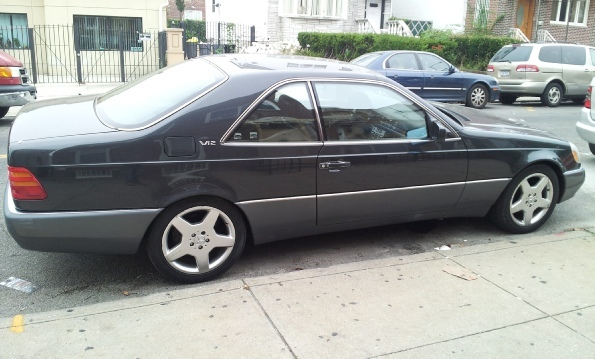 I found 1992 500SEL for sale in Long Island. 1992 Mercedes Benz 500SEL black on black. I absolutely fell in love with it second I saw it. No dents on the body, no damage to interior but it was very dirty though. Main problem was engine failure. One of the distributor cap rotor broke. Car started to misfire but customer drove on four cylinders for two more miles. Driving on four cylinders put lots of strain on timing chain. Top chain guides broke and chain skipped two teeth on camshaft gear. Luckily valves did not bend. I towed the car to my friend’s parking lot, opened valve covers, put new chain guides, chain tensioner, new distributor caps and rotors, set timing, started the car and drove away. 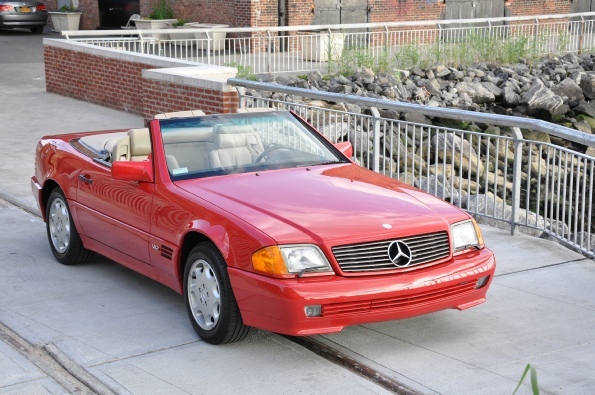 I put lots of time and money restoring this car to its glory, could have bought a nice running S-class for that money. But I gained very valuable knowledge and experience working on one of the best cars ever built. I drove 500SEL for more than two years. One day I saw an ad for 1996 E320 for sale for $1200. Car would not start, starter would not engage. Went to look at it and car turned out to be very nice except dent on passenger rear quarter panel. It was burgundy on beige leather and it had full custom entertainment system custom built subwoofer enclosure in the trunk, sport suspension, 18” AMG rims, back up camera, headrest monitors, playstation2, iPod dock. The problem was the flex disc broke and drive shaft separated from transmission flange. Emergency brake cable wrapped around drive shaft bending gear selector link. Gear selector link pulled neutral safety switch out its alignment. Without neutral safety switch the car didn’t crank. I decided to take a chance and bought it. Had it towed to my friend’s repair shop so I could use lift. Bought new gear selector link and flex disk. I bent neutral safety switch back and the car started fine. I drove it for a little time. 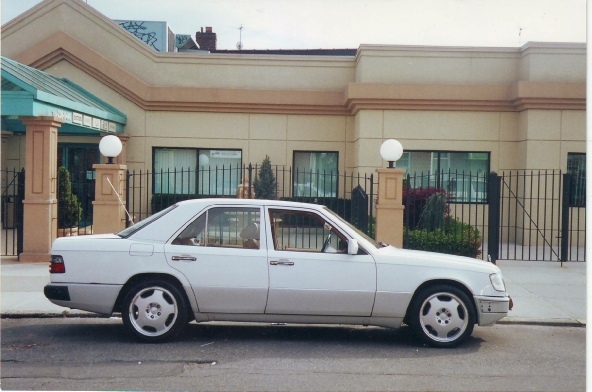 I still had my 1992 500SEL at the time and it was really hard for me to make a switch from S-class to E-class even though E-class had all the bells and whistles. Someone made an offer on E-class and I sold it. W210 E-class is a very nice car and I certainly would recommend it to anyone who is looking for comfortable midsize Mercedes. 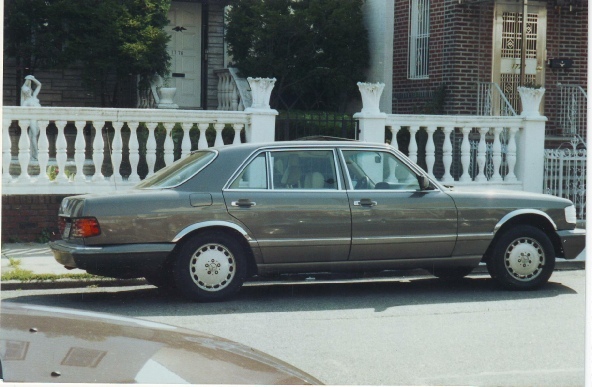 I missed S-class and bought 1994 S500 with 160000 miles in New Jersey. Interior was mostly disassembled, whole dashboard removed and placed in back seat and trunk. Serious short developed in body harness behind dash. Lots of wires melted together, smoke came out behind cluster. 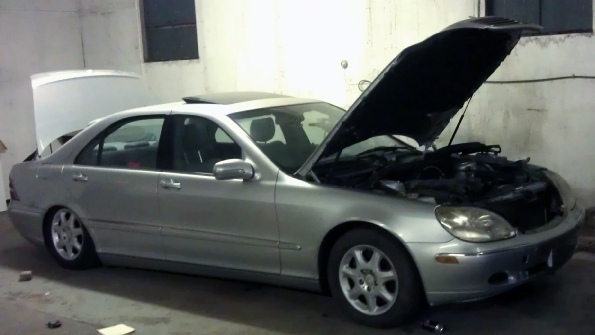 Mercedes dealer started the job, removed dashboard, but after dash was removed demanded more money for labor. Owner refused to pay extra (over $2000 more in labor) and junked the car all together. The car was in very nice cosmetic condition with all removed parts in back seat and trunk. I came over, connected some connectors, and car started on first crank after sitting for three months. Transmission engaged smooth, no delay in reverse. So I bought the car, took heater box out and replaced evaporator at home, went back with tools, installed heater box and most of dash back in, and drove away. When back at home I finished interior assembly. More repairs were done to the car, including rear hydraulic struts to regular shocks and springs conversion. Sold it to friend of mine. 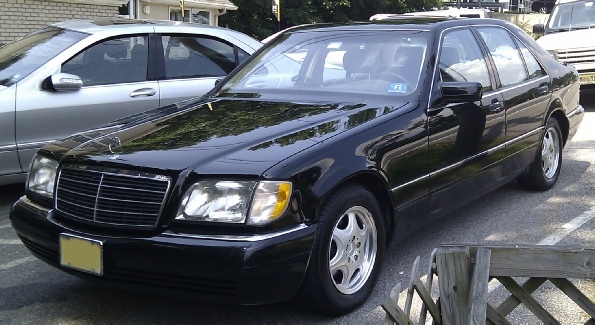 In July 2011 I sold 1994 S500 and bought 1997 S320 with 117,000 miles. It came with full dealer history including head gasket replacement. S320 has much weaker I6 3.2 liter M104 engine than mighty M119 V8 5.0 liter. You can feel some lack of power going uphill with loaded trunk and full tank of gas. In the city, there is plenty of power even with A/C on. Gas mileage is great and engine power output satisfies me completely. I love HFM engine management along with 722.6 transmission. There are some repairs I had to do to a car but it was in excellent condition. In 2017 I replaced both front springs, lower control arms, sway bar links and bushings, brakes, water pump and serpentine belt. Very reliable car. Gave this car to my mother who still drives it. 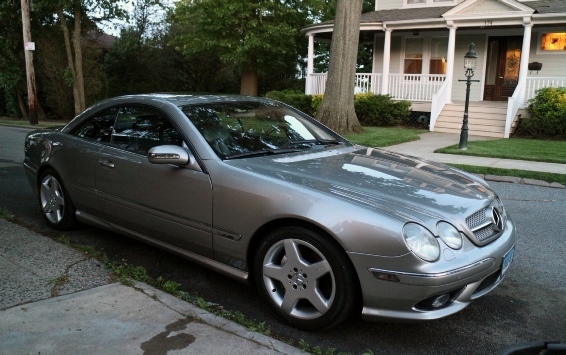 In the beginning of 2012 I purchased 2002 S500. Engine ran and car drove. AirMatic was not working, car sat on the floor with front shocks not holding air. And lifters were noisy. It turned out that one shock was blown and other was leaking from top seal. Replaced blown shock with used one and repaired top seal on other shock with repair kit. Valve train noise turned out to be a very serious issue-engine was full of sludge. Removed complete valve train with cams from both sides, cleaned it very well, replaced exhaust lifters, cleaned oil pan, ran kerosene through motor mixed with some oil. Noise almost went away but I never drove the car. Received an offer and sold it as project to mechanic who wanted to finish repairs. Around March of 2012 bought 1997 C280 Sport. Car had problem with flooded transmission computer, TCM, along with other issues. It would start and drive but would not switch gears. Put in TCM from my 97 S320 and drove the car home, about 15 miles. Ran OK but would not shift past third gear. And under closer inspection found out that oil mixes with coolant. Head gasket was leaking. Removed the head and replaced head gasket. Bought used TCM with same number transmission still would not shift past third gear. The problem was in shifter. Disassembled shifter and found contacts all corroded inside selector module. Cleaned contacts, repaired W/S switch that was also broken. Drove this car to Chicago and back, no problems. Sold it in 2013. Around June of 2012 bought. 91 500SL. 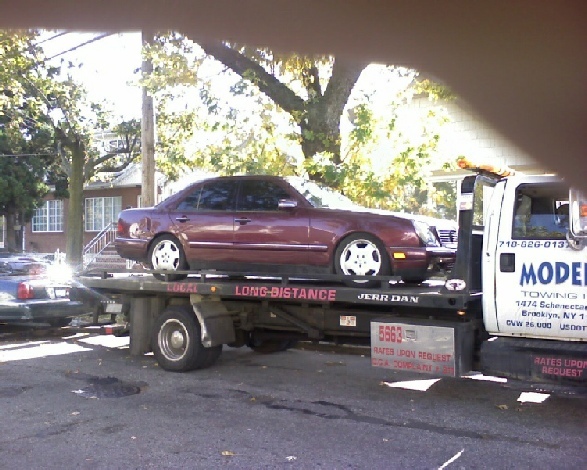 Car would crank but would not start, had to tow it from Connecticut to NY. Under closer diagnostic found no power to ECU. Turned out to be faulty ignition switch contact. Replaced contacts and car would start and drive. Many repairs went into this car and it is still ongoing restoration project. I replaced seals in all roof cylinders, replaced whole soft top frame due to chrome oxidation, installed custom subwoofer behind seats, replaced seats, had lower covers repainted, repaired seats and mirrors controls, rebuilt soft top control module. Last year I finally rebuilt transmission valve body and rebuilt fuel distributor. And finally fully tuned CIS-injection to spec. Once I have some time I will replace water pump due to bearing noise and car will be ready. I don’t really drive it and will sell it after all repairs are complete. Then I bought 2000 S430 in very nice condition with 140k miles. Car had fresh water damage to computers on the passenger side by windshield. It would recognize smart key and power would come up but would not crank. Under closer diagnostic it was determined that transmission computer, TCM, was completely non functioning. My Star Diagnostic would not read it at all. Main ECU was reanimated by cleaning and soldering few terminals. TCM was also damaged. It was determined that main power chip was not good. I happen to have old TCM from C280 that was flooded also but power chip was still good. Replaced chips and original TCM started to work fine. Cleared all codes and car would start and drive fine. Other small issues came up but were sorted pretty fast. Also, second smart key did not start the car. Found cracked transistor on key board. Bought used key and sourced transistor from it. Second key works fine now. AirMatic had issues and dampening system had issues but they were resolved quick. Radio didn’t play due to failed fiber optic ring in phone or voice recognition modules. Just bypassed them for now to have sound. While working on radio I hardwired bluetooth module into cassette circuit inside radio. Sound and operation was so good that I installed same adapters into my other cars. Drove this car for awhile and sold it in the summer of 2015. 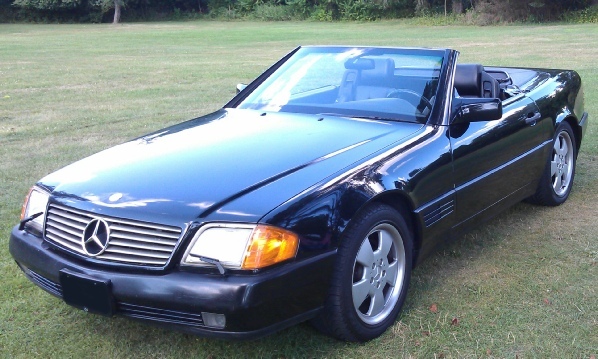 Also, bought 1995 S600 coupe. 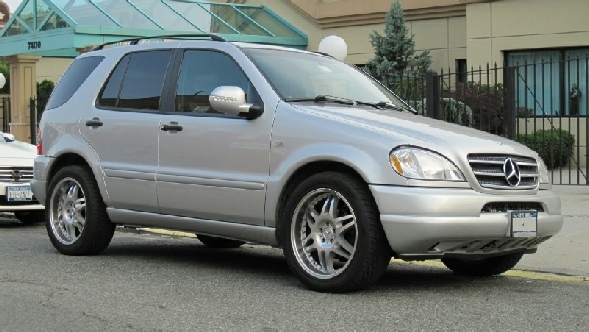 Always wanted V12 W140. 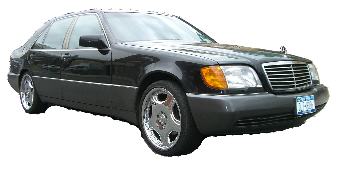 This S600 is in very nice condition but mechanically it was total disaster. Engine did not run at all and transmission needed complete rebuild, had no reverse and slipping from 2nd to 3rd. Exhaust was cut and catalytic converters removed along with O2 sensors! Door lock pump was burned. And on top of all that engine was foamed by fire department. Catalytic converters started to smoke while driving and owner called fire department due to smoke coming from under the car. After I started the engine only 9 cylinders worked, drove it on 9 cylinders from PA to NY. Lots of work was put into restoring this car to bring it back to it’s glory. As of 2017 it has close to 200,000 miles and being driven daily. In early 2015 I purchased 2003 CL600 twin turbo V12 Renntech tuned, W215 chassis with 115,000 miles. Car is in excellent condition in and out. It suffered ABC suspension failure along with misfires, intercooler pump issue, Evap system issue and other minor issues. ABC high pressure expansion hose broke. To replace it engine needed to be raised. While at it I replaced rest of suspension hoses. When high pressure hose broke hydraulic fluid covered all coolant hoses and front of engine. Coolant hoses became soft and while I had access I replaced all of them. ABC pump was also destroyed driving car with no hydraulic fluid. Replaced pump with rebuilt unit. Recalibrated vehicle height. I rebuilt one ignition coil pack but second coil pack needed to be replaced with new one. Intercooler pump was not original, connector was broken. Adapted connector and made bracket to hold pump in place. When replacing coolant hoses I drained intercooler circuit. Mercedes uses special equipment to refill and bleed intercooler circuit. It is independent from main engine coolant circuit. I made my own adapters and bled the system. Also replaced transmission electrical plate, fluid, connector. Car runs and drives fine now. In early 2016 I bought this 1994 SL600 with less than 29,000 miles. Car is in excellent condition. It was always garaged and came from California. This V12 has electrical gremlins, suspension needs repairs, soft top does not work, couple of small cosmetics. When I have some time I will repair this beauty and it will be ready for sale soon. At the moment I rebuilt both throttle bodies and replaced suspension accumulators, repaired soft top, repaired suspension manifold, all electrical gremlins sorted.